India's Viswanathan Anand has retained his FIDE World Chess Championship title by beating Russia's Vladimir Kramnik in Bonn, Germany. Anand defeated Kramnik 6.5:4.5 (11 games). 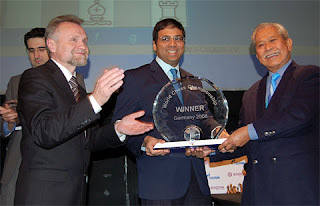 According to Garry Kasparov, "A great result for Anand and for chess. Vishy deserved the win in every way and I'm very happy for him. It will not be easy for the younger generation to push him aside." SciAm: Jacking into the Brain--Is the Brain the Ultimate Computer Interface? What, then, might realistically be achieved by interactions between brains and machines? Do the advances from the first EEG experiment to brain-controlled arms and cursors suggest an inevitable, deterministic progression, if not toward a Kurzweilian singularity, then perhaps toward the possibility of inputting at least some high-level cognitive information into the brain? Could we perhaps download War and Peace or, with a nod to The Matrix, a manual of how to fly a helicopter? How about inscribing the sentence “See Spot run” into the memory of someone who is unconscious of the transfer? How about just the word “see”? When I first heard that Oliver Stone was making a film about George W. Bush I immediately assumed that it was going to be an unapologetically liberal roast-fest. I imagined W. to be a scathing and unrelenting portrayal of arguably the worst president the United States has ever seen. With popular culture fueling my expectations, I imagined a surreal and glib rendition of the current administration along the lines of Saturday Night Live or the Colbert Report. But after reading the reviews and hearing about Stone's supposedly 'fair' and 'balanced' portrayal of Bush, I started to pay more attention. Some commentators went so far as to say that the movie made them feel pity for the man. What was Stone up to? This is the last director, I thought, who would let the Bush administration off easily. And Bush is the last president, I thought, who deserves anyone's pity -- a man who has done more to terrorize people at home and abroad than the terrorists he's worked so hard to combat; a man who started an illegal war in the Middle East that has caused the deaths of nearly 100,000 civilians; a man who ignored one of the worst natural disasters to strike the US in modern memory; a man who has created unparalleled divisiveness amongst his own people. I could go on. And even for me -- a Buddhist who strives to practice universal compassion -- this man has put my patience to the test. Given all this I was very motivated to see and judge this movie for myself. And indeed, it was no late-night television caricature. Rather, W. is a typical Hollywood foray into super-realist cinema. But it is a realism that is far more upsetting and revealing than any pithy character attack. 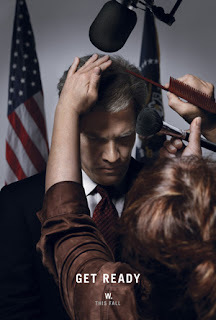 By painting a fairly objective and first-person portryal of Bush, and by dramatising the twisted machinations and personalities of his administration, Oliver Stone has created a disturbing film that undoubtedly offers more impact than any other approach. The realness of it -- being right there amongst the major players and watching the events unfold -- cast an eerie light on not just this administration, but on the United States itself and how politics is done in that country. W. subtly reveals the perils of populist politics by chronicling the unexpected and advantageous chain of events that brings the most unlikeliest of men to the White House. During one scene, for example, the campaigning Bush touts his ability to connect with ordinary citizens on account of his experience running the Texas Rangers baseball club. It's impossible to watch this scene and not think of Sarah Palin as she uses her experience as a hockey mom to appeal to populist sensibilities. This is an America that is consistently asking for trouble by grossly over-estimating the abilities of certain politicians. Stone presents a George W. Bush who is ignorant, arrogant and shockingly unreflective -- a man who is driven by sheer ego and an unchecked desire to prove himself. At no time does this man ever question his own qualifications; in fact, the movie portrays Bush as a man who actively deludes himself into thinking that the ideas of his advisors are his very own. He is the 'decider' after all. But he comes across as the puppet president who doesn't realize how utterly dependent he is on others and how they pull his strings. And when things don't go according to plan, he retreats like a sulking teenager to his room to watch sports highlights. Yes, Oliver Stone created a fair portrayal of Bush and it is within this fairness that we find truth and insight. But just because we get to see a humanized George W. Bush in context doesn't diminish the horrors of this administration. If anything, it reveals a far more frightening snap-shot of Bush's first term than could have been expected. This is the story of the accidental president who, motivated by ego and a deluded sense of religious mission, utterly failed to acknowledge that his weaknesses and deficiencies as a person made him a poor candidate for the executive office. The end result was, as proclaimed by the imaginary figure of his father, a complete fiasco. So, is this a man who deserves our pity? Well, insofar as he is a man blinded by ego and delusion, yes he does. This man has lacked the courage and humility to admit his weaknesses, and as a result, took advantage of a country that celebrates the notion that anybody can grow up to become president. Indeed, any American can become president of the US -- of that we are now certain. But that doesn't mean that everybody should. Labels: film review, george w. bush, w.
Did you know there was such a thing as 'Quantum Darwinism'? Indeed there is, and it postulates the theory that quantum mechanical states are selected and reproduced. There has been some outrage recently over attempts to contact intelligent aliens, where instead of hiding in the corner and listening real hard some astronomers beamed intense directional messages up up and away. What if people are biologically unsuited for the American dream? The man posing that troubling question isn't just another lefty activist. It's Peter Whybrow, head of the Semel Institute for Neuroscience and Behavior at UCLA. Sarah Palin is by no means the first buffoon to run for vice-president. In fact, the United States has had the misfortune of of actually having a buffoon for vice-president. I'm speaking, of course, of Dan Quayle. Now seems like a good time to re-post a SentDev article from June of last year, "Dan Quayle quotes." Apropos of completely nothing (aside from my wanting to spark a discussion of the anti-intellectualism that runs rampant through the Republican Party), I discovered a page of Dan Quayle quotes that I had to share. Anders Sandberg responds to Bill McGuire's review of Global Catastrophic Risks. 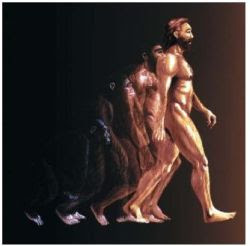 The message of transhumanism - the hope that inheres in the enhancement of human capability seems overrated to me. Where will the idea of sports go with the introduction (and advancement) of genetic engineering? Will such technology, which has high hopes in enhancing ourselves to be better humans, ruin the very idea of sports? Perhaps the most striking fact revealed by the global financial crash -- or rather, by the reaction to it -- is the staggering, astonishing, gargantuan amount of money that the governments of the world have at their command. The BBC has some film footage of the legendary Bluegrass musician Eddie Adcock playing the banjo whilst having his brain operated on. Scientists are using cutting-edge scanning technology to watch the meditating mind at work. 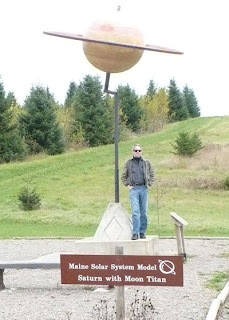 My friend and blogger Jeff Patterson recently visited the Maine Solar System Model and did a photo-essay about it. 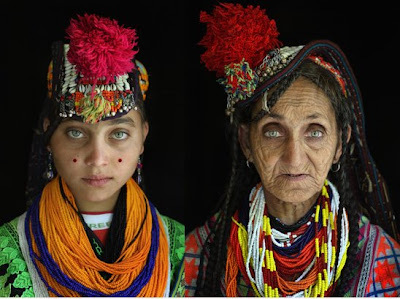 Check out the entire photo essay. In economic theory the winner's curse refers to the idea that someone who places the winning bid in an auction may have paid too much...The same thing may be happening in scientific publishing, according to a new analysis.